This facility is located in the Australian out-back, and is one of a number of NSA bases located world-wide within the UKUSA network. 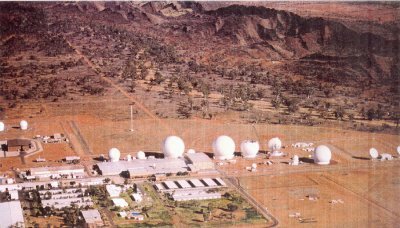 Pine Gap is very remote, and seems to have a multitude of functions attached to it. It has been linked to the UFO phenomenon by a number of researchers, and appears to have been the source of the ‘beam’ that appeared on the famous STS 48 footage, causing the anomalous objects, caught on the Space Shuttle’s video camera, to veer off in a multitude of directions. 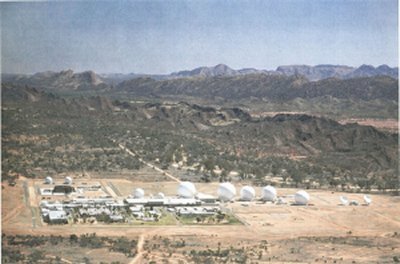 This has caused some researchers to speculate that Pine Gap is home to ground-based ‘Star Wars’ weaponry, capable of a first-strike against UFOs, or foreign satellites in a low Earth orbit.